Seriously - what's not to like about this lineup? Paris was Paris - we'll always have it. But now the challenge is different. Three home matches in a row is definitely a positive thing, and having a week off in between them with no travelling certainly helps with the player protection, but they still have to be won. I had a bit of a grumble on the twitter machine yesterday after seeing players referred to as being 'dropped' but it couldn't be used for jerseys 9 through 15 and for all we say about our immense squad depth, to be able to give that group another go the following week is a massive boost to them. If one was under a bit of pressure it's possibly Jacob Stockdale but it's clear Joe has faith and this is a great opportunity for him to remind us what he showed only last November. There are a few changes in the pack but Leinster fans especially know full well that Jack McGrath, Devin Toner, Dan Leavy and Jack Conan are all exceptional names to bring in when required. All bar Conan were heavily involved in those famous 41 phases and they'll be chomping at the bit to make some more history over the weeks to come. I'll be surprised if our approach this Saturday is similar to last - while that was a cup final, this is an opportunity to make a proper statement to the rest of the field that we're serious contenders. That said, we don't want to be showing future opposition our full hand in terms of set plays etc, so it will be all about striking the right balance between conservative and 'gung ho'. Are the Italians likely to offer much by way of a challenge? 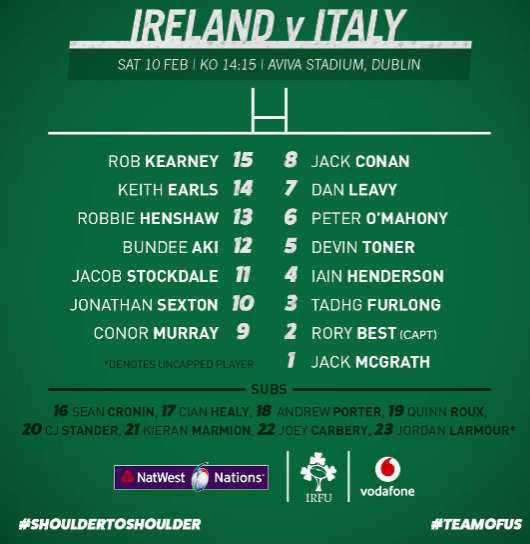 Well, they can never be taken for granted that's for sure, and just look who's at the helm...Conor O'Shea wasn't just sitting on all those RTÉ panels for the sake of it...he knows this Irish set-up as well as anyone, and what's more, he showed against England last year that he's not afraid to throw the odd tactical curveball. He will also have noticed how much success France had putting so much effort into defensive organization. But man for man we should be able to impose ourselves on this one early, and key for us will be that first try of the day, which in turn would be our first of this Championship don't forget. The bookies have us winning by 34 and I'm sure there are some fans who will be givving out unless we win by fifty but for me I'd be happy with a bonus point win using the whole bench strategically and a margin in the mid twenties. PS - We're going to all three Ireland v Italy Six Nations matches this weekend - best of luck to all teams in green, can't wait!!! Replacements: 16. Leonardo Ghiraldini 17. Andrea Lovotti 18. Tiziano Pasquali 19. Federico Ruzza 20. Maxime Mata Mbanda 21. Edoardo Gori 22. Carlo Canna 23. Jayden Hayward.